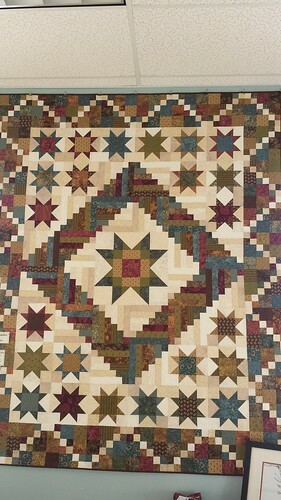 One quilt that I have finished recently is Terry Atkinson’s Monterrey Medallion. A book that she release in 2005 and at the shop where I work we kept getting calls for this book. The cover isn’t too impressive. I kept wondering what is so cool about this quilt???? We would ship out what we could, warning people that there weren’t many books left! Well looks like Terry fixed that problem! She printed more books! My boss wanted me to do a new version. When I agreed I had no idea what I was going to make the quilt out of. I decided that I wanted to do something with batiks….because well they are one of my favorites. But I also wanted to try to mix batiks and cottons like Edyta Sitar at Laundry Basket Quilts does. I have made several quilts for the shop but I don’t think I have made a quilt before that was this popular. The kits are literally flying off the shelves! 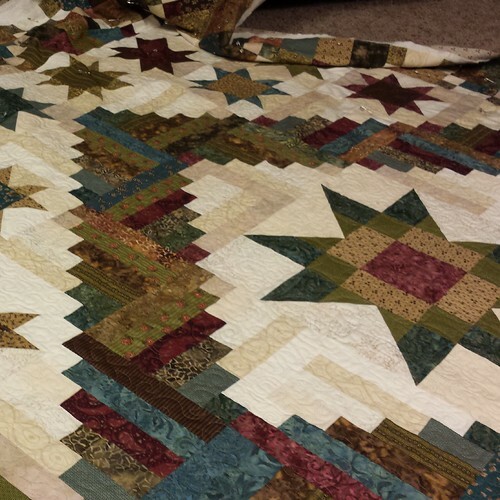 What are some quilts that you have made that are winners?